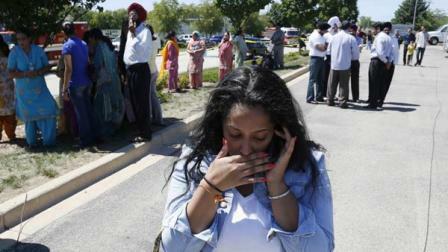 OAK CREEK, Wis. — At least six people were killed Sunday when a gunman opened fire at a Sikh temple near Milwaukee, authorities said. The suspected shooter was later killed in exchange of gunfire with police.Police were called to the Sikh Temple of Wisconsin in the suburb of Oak Creek on Sunday morning, when witnesses said several dozen people were gathering for a service. Greenfield Police Chief Bradley Wentlandt said the first officer to arrive encountered a man police believe was the shooter. The two exchanged gunfire, and the suspect was killed, he said. Wentlandt said police do not believe a second shooter was involved. He said tactical units went through the temple. They found four people dead inside and three outside the building, including the suspected shooter, he said. It’s unclear how many others were wounded. Wentlandt said he had been told the officer who exchanged gunfire with the suspect and another person had been taken to hospitals. He said the officer was shot multiple times and is in surgery. The spokeswoman for the area trauma center said three victims were being treated there, including one in surgery. Sukhwindar Nagr, of Racine, said he called his brother-in-law’s phone and a priest at the temple answered and told him that his brother-in-law had been shot, along with three priests. The priest also said women and children were hiding in closets in the temple, Nagr said. Sikh rights groups have reported a rise in bias attacks since the Sept. 11, 2001, terrorist attacks. The Washington-based Sikh Coalition has reported more than 700 incidents in the U.S. since 9/11, which advocates blame on anti-Islamic sentiment. Sikhs don’t practice the same religion as Muslims, but their long beards and turbans often cause them to be mistaken for Muslims, advocates say. Sikhism is a monotheistic faith that was founded in South Asia more than 500 years ago. It has roughly 27 million followers worldwide. Observant Sikhs do not cut their hair; male followers often cover their heads with turbans — which are considered sacred — and refrain from shaving their beards. Years of Islamophobic hatred against Muslims, and the promotion of the conspiracy theory known as ‘Stealth Jihad’, has yet again lead to deluded Americans becoming radicalised and enacting acts of violence upon the perceived ‘enemy in their midst’ that Islamophobes like to preach their vile hatred at. In this case, the attacker, no doubt stirred on by the Islamophobic teachings, happened to mistake Sikhs for Muslims. The tragedy is no less, or more, horrific for that. The thoughts of MDI are with the victims’ families, as well as our concern for the safety of American Muslims. To all the Islamophobes out there, their blood is on your hands. Mr Abdullah al Andalus, This is a tragedy of any scale to people. But for whom of concern to Freedomphobia, there are people who will at anytime take an odious circumstance and but their spin in it. Spiff up the recipe. No! The blood is on your hands. When there is a group out there claiming a stealth jihad is occurring, to subvert freedom, and to take over and make everyone slaves or put them to the sword, you don’t think that’s going to stir up a few crazy people to take action? Mosques have been labeled as the gathering points for Muslims where they conduct their stealth jihad, and that mosques aren’t mere houses of worship, so is it any wonder a person would want to attack such a facility (thinking it was a mosque) after being told so many negative things about what’s happening at mosques? These pork eating , pagan Christians are the biggest fascist on earth . They would be no crusades , no world war 1 and 2 , no Hiroshima and Nagasaki , no inquisitions , no gas chambers , no Bosnia , no Rwandas , no killing of native populations as in south america , there would be no millions of death in Iraq , Afghanistan , no drones killing innocent people etc etc ……. These Christians are the 4 beast mentioned in Daniel 7 . See what the verse says ‘ he shall speak great words against most high ‘ .The Christians speak great blasphemies against most high by saying him he is a trinity . The verse continues as ‘ think to change the law ‘ .The Christians changed the law of God given to Moses . Let us all come together and finish off this beast who is a Scrooge to the world and God most high. Mr Jesus, Islam has had 1400 yrs or better to show the world.And the job hasn’t be very done well. Cease with the veering to propaganda this is know more than quadrillon of times people have heard this heap. qouting bible scripture out of content. You act as if you have a case of Freedomphobia. Mr Sami Zaatari, Islam around the world is causing pandemonium. A house of worship is not needed to stur up people. Also people have awoken to islam it’s not stealth anymore in most parts of the world. there are still pockets of people whom are getting the sleep out of their eyes those are the ones that the stealth is about. There is a case of freedomphobia occurrence for islamist’s. I wonder what if the gunmen had any sign of muslim, the media will flood the headlines with Islamic extremism sort of stuffs. If you look at the photo of the gunmen Wade Michael Page, there’s one prominent tattoo we can see clearly on his left shoulder the Celtic Cross. This is undountedly a Christian symbol. Like it or not, Wade Michael Page is a Christian extremist. I thought the Celts were pagans. Ric,Ric,Ric. The cross is not a Christian symbol. It is a symbol that people of all sorts of people through history have used as other symbols in history. The crucifix is Christian symbol. What you are doing is yelling wolf. Im not sure whre u from but Im from the far east and here we *all* know cross is a christian symbol. Google “cross” ..
Mr Erasmus, Yes to your comment. Sorry to report that there are people in the worlld who have freedomphobia. Ric. As I said there are people through history whom have used symbols. I will try to be your ground guide. To crucify the Romans would put people on a cross but when Jesus was hung on a cross that made it become know as the crucifix. Which is the exact symbol of Christianity. . When one of his disciple, Pete cuts the High Priest’s Slave’s ear off, Jesus does not stop him and tell him to get rid of his sword, rather he tells Peter to return his sword to his sheath where it will be ready for use when it is once again needed. I have not yet reproduced text in the old testament, which is full accounts of God intruct the Jews to Kill..
Another church attack in Nigeria, another 19 Christians killed. Which religion? I don’t denied Muslims carried out those attacks. My point is why the double standards?? Mainstream media and Christians quickly deny any Christian ideologues for those evil doers. . I mean, if Osama bin Laden is called Muslim terrorists. certainly Michael Page can also be called a Christian terrorist. Bin Laden and other “Islamic” terror member carried out their crime not for reasons of personal piety (none of them come from religious background, mostly are secular educated engineers) but because they were lured by the image of injustice and oppression from “western” hegemony ie in a war situation. They saw themselves as religious warriors. And so is Michael Page. The evidence indicates that he thought he was defending the white Christian society against non-white non-Christians invaders. Like TimMcVeigh, and Anders Breivik, it was clear that he battled to save white Christendom. There are no umpires having double standards with violins. But there are Muslims whom veer of them selfs to get thematics put on ? Ric. Michaell Page is insane not christian. You are making no points as for others names the same. Bin Laden on the other hand gave money and helped terrorist groups. now who are willing to send armies to invade sovereign nations by unproven reasons (for ‘alleged evidences of ties to terrorists’ or fictional weapons of ‘mass destruction) ilegally occupying it, bombing innocent targets and killing almost daily?? Why you seems unwilling to have the same symphaty to the victims and label those reponsibles for murderous rampage, the big terrorist group?